Little did Max Weber know that his essay 'Protestant ethic and the spirit of capitalism', written in 1905 (which was republished in 1920), would survive the times and still be a source for discussion and interpretation during the 21st century. Today as in previous times, work and the workplace poses its challenges. The common thread through history seems to be attempts to enhance the workplace, to better it, to convert it into a place where people could work with a free spirit. Yet, in spite of all the attempts, one failure after the other has been recorded. In a research program that endeavoured to construe the meaningful workplace, Protestant ethic was identified as one possible contributory towards such an ideal. This article explores the contribution of Protestant ethic as a contributory and sets it within the framework of universal individual values pertaining to work and work-specific values. The article also indicates that the Protestant ethic can indeed contribute towards a meaningful experience whilst performing work-related tasks in workspace. The Protestant work ethic is more than a cultural norm that places a positive moral value on doing a good job. Based on a belief that work has intrinsic value for its own sake, it represents a value system that contributes to the experience of meaningfulness whilst performing work. A previous article established the context and framework of the construct 'a meaningful workplace' and described the two macro-dimensions that contribute towards the meaningful workplace. Against that framework, this article indicates that the Protestant ethic as a concept substantially contributes towards meaningful work experiences and, by means of inference, also serves as a contributory towards the creation of a meaningful workplace. The loss of meaning experienced by employees whilst performing work-related activities in the work space has been discussed in an article titled A meaningful workplace: Framework, context and space (Steenkamp & Basson 2013). It was also stated that the loss of meaning at work inspired the search for the meaningful workplace. In the article referred to above, two macro-constitutive dimensions which are comprised of various constituent categories were identified, each category being comprised of certain factors. During this discussion, reference was made to a 'value cluster' that contributes towards the experience of meaningfulness in the activity of working. By means of an abductive reasoning process,1 I indicated that the value cluster contributes substantially towards meaningfulness at work. Therefore, it also contributes to the construct 'meaningful workplace'. It was also stated that Protestant ethic (PE)2 supports and forms an integral dimension of the value cluster. The fact that the current discussion focuses on PE does not imply or suggest that other religion-specific values pertaining to work cannot and do not contribute towards the experience of meaning, thereby contributing towards the meaningful workplace3. Although the aim of this article is not a comparative study, it would seem possible and even valuable if research were to be undertaken into an ethical system pertaining to economic life (as a class of life activity; economic behaviour is thus a class of behaviour), into a religio-spiritual conceptual approach towards economic life (as a category of economic behaviour), into the comparison between various religio-spiritual faith systems (as types of such a category) and into behavioural markers (as observable phenomena) in an economic system. This is however not pursued here as the focus is limited to the construct Protestant ethic as the spirit of capitalism as proposed by Max Weber. The focus is further on the possible contribution of such an ethic towards a meaningful workplace. There is no doubt that many questions present themselves when a topic such as Protestant ethic is tabled. The questions and uncertainties multiply when the concept Protestant ethic is related to and described as a contributor to the construct 'a meaningful workplace'. Is Protestant ethic (PE), viewed as a value system (by no means the only possible system of this type, i.e. a system founded in religion), important enough to identify it as facilitating meaning in the work environment and thus as a constitutive dimension of the construct 'a meaningful workplace'? Other types of value systems emanating from other religious or faith systems can in their own right also contribute towards meaningful work experiences, and by inference towards a meaningful workplace. Secondly, is the concept: 'Protestant ethic' meaningful in itself, and is it, within the framework and context of the meaningful workplace in a postmodern setting, still valid to refer to this ethic as such? Thus, can we still refer to the structure of this ethic or value system as 'Protestant'? Even more fundamental for any reader are the questions: Is an article that discusses PE as a contributor to the experience of meaning a defence thereof, or is it a vindication of Weber's work? Furthermore, does this article represent a particular interpretation of PE? Even more fundamental: Does it propose PE as the only ethical and value system that could contribute to a meaningful workplace? Questions such as these reach further than purely trying to determine the validity of PE as a concept or the question whether adherence to such an ethic, specifically applied within the workspace, realistically contribute towards meaningful experiences at work. These questions touch upon the essence, practice and sine qua non of corporate governance. Although it might be interpreted as an individualist perspective, PE acquires a broader scope when viewed against the background of the previous statement pertaining to governance issues. Such an ethic, whether we call it Protestant or anything else, is an unavoidable issue, specifically against the background of fraud, tenderpreneurship, graft and outright theft in the South African context. Without such ethical fibre, the South African society will wither economically, resulting in utmost poverty and the social ills that go with such deterioration. Calvin's thoughts on the doctrine of the elect. Underpinning this discussion, the following elements will be presented: the Zeitgeist of the 18th and 19th centuries, Max Weber's perspective in 'The Protestant Ethic and the Spirit of Capitalism', which will include a rendering of Weber's perspective on the characteristics of PE as well as the 16th century background to the publication of Max Weber including the characteristics of PE as Weber saw them. This is followed by an eclectic rendering of research on the concept PE, which will include reference to contemporary research in respect of PE as the spirit of capitalism. In closing, some conclusions will be presented. These universally recognised values are imbedded in a typology of four value clusters with which individuals and societies must (and do) cope (Ros et al. 1999). Table 1 indicates the four clusters and the ten basic human or individual values with core definitions. Key towards understanding the different value types and the dynamic interaction is an assumption that there are psychological, practical and social consequences related to these values (Ros et al. 1999). Work values represent specific 'beliefs pertaining to desirable end-states (e.g. high pay) or behaviour (e.g. working with people)' (Ros et al. 1999:54). 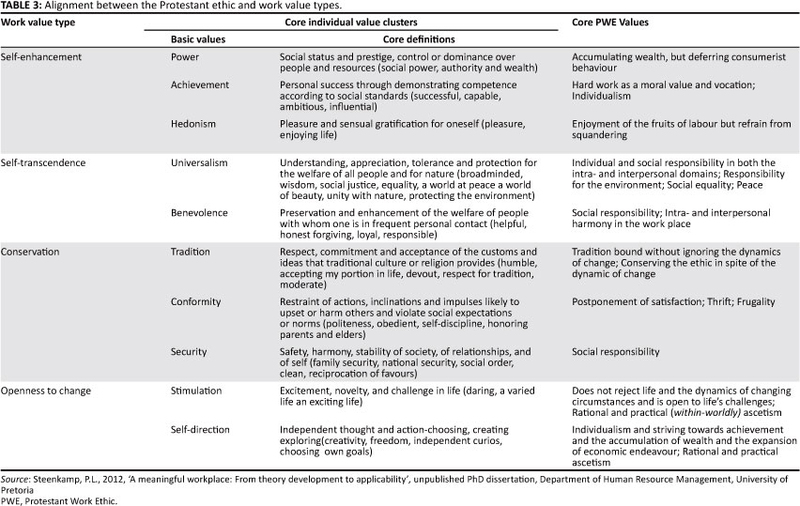 Work values are defined within a context, and despite a plethora of different labels, researchers all appear to identify the same two or three categories of work values, that is, (1) intrinsic or self-actualisation values, which directly express openness to change, the pursuit of autonomy and interest in growth and creativity at work; (2) extrinsic or security or material values, which compare directly with individual values such as conservation values and include job security and income; (3) social or relational values, which express the pursuit of self-transcendence values where work is seen as a 'vehicle for positive social relations and contribution to society'; and (4) self transcendence, which is a value type that includes such concepts as universalism, (which in this sense refers to the experience of inclusiveness of man based on the notion of self-transcendence, thereby affirming that self-transcendence is a universal human trend), and 'benevolence' (as an indication of a basic disposition to do well through work). Ros et al. 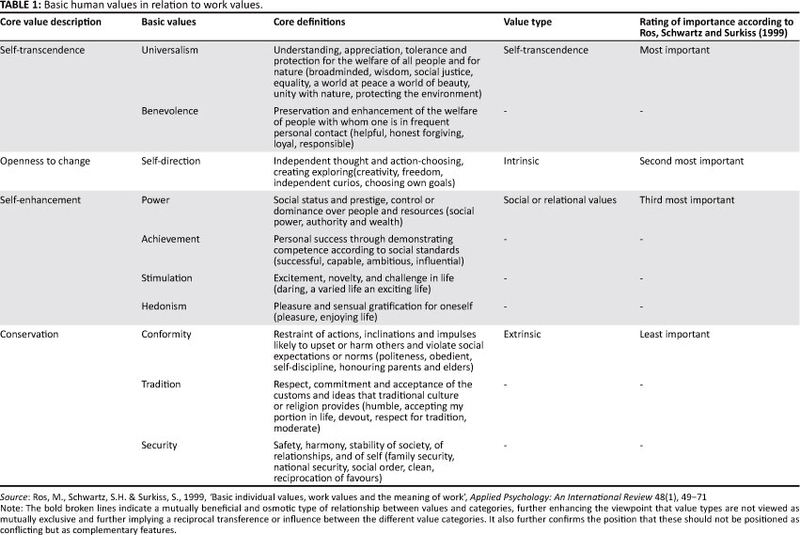 (1999)10 conclude that the groups with which they had worked rated self-transcendence values as most important whilst values related to openness to change were rated second. Self-enhancement values were rated third important, and conservation-type values were rated lowest. We now divert to a discussion of PE before returning to values and the relationship between the PE as a value system and the link with universal and work-related values. The 17th and 18th centuries (in the Western world) can be described as the age of optimism. Europe had emerged from the (so called dark) middle Ages. The new science revealed the universe as a vast but simple and orderly mechanism where linear principles that could be discovered by the human intellect11 are at work. As part of such an orderly mechanism, everything is subject to prediction, which implies control and thus accounted for the view of unlimited progress and material and social well-being. The application of science to operational technology, however, dispelled the euphoria and man became sober in the realisation that optimism was a misplaced acceptance of that-which-is-(perceived as)-good (Jones 1975). Around 1850, technological progress gained even more ground with the development of ships with steam engine, followed by the internal-combustion engine and the generation of electric power. These developments provided new opportunities that brought about migration to the cities on an even larger scale. Within this framework, Protestant ethic gave 'moral sanction to profit making through hard work, organisation, and rational calculation' (Yankelovich 1981:247). This ethic spread throughout Europe and to America through the Protestant sects, in particular, the English Puritans, the French Huguenots and the Swiss and Dutch reformed who subscribed to Calvinist theology, a system that was conducive to productivity and capital growth in its approach towards work and profit making. Beliefs which supported hard work became secularised and were woven into the norms of Western culture (Lipset 1992; Rodgers 1978; Rose 1985; Super 1982). Against this background, Max Weber published his essay, 'Protestant ethic and the spirit of capitalism', in 1905. It is not the intention to provide a history and background of Maximilian Weber. There are sufficient sources where a biographical description can be accessed. According to Le Roux (2004), Max Weber, throughout his life, was interested in the nature of Western culture, interrogating the social dynamics that created a different type of cultural pattern to that of Eastern Europe. Apparently Weber made a substantial discovery, which his wife (Le Roux 2004:743) referred to as the 'influence of thoughts and lifestyle'. The Western civilisation and all its forms of existences (i.e. sub-cultures) were established through ideas and style of living. These thoughts were initially formed by the Greeks and supplemented with a particular lifestyle during the Reformation.14 A theoretical and practical rationalism influenced the West to such an extent that 'reason and ethic' converged. Theory and practical rationalism (a so called double-sided rationalism, see Le Roux 2004) were the breeding ground for the facilitating role of 'the idea' that created the Western world. This type of convergence (if we may call it that) - between theory and rationalism -influenced the West to the extent that it eventually caused a cultural pattern distinctly different from Eastern Europe and other cultures. Religious ideas, specifically, gave rise to certain behaviour patterns (according to Weber in Le Roux 2004), which led to a certain type of social and economical behaviour: 'Ideas are always linked to self interest, and only survive for as long as they are linked to real interests, because (ideas) legitimise interests' (Le Roux 2004:744). According to le Roux (2004:744), Weber demonstrated this very clearly in his now famous thesis that the Protestant ethic created the conditions conducive to a certain economic behaviour pattern, that is, capitalism. The Church Reformation represents a period of religious and political upheaval in Western Europe during the 16th century. Two key figures influenced the development of Western culture and more specifically the approach to work during this period, that is, Martin Luther and John Calvin.17 Of the two, John Calvin was the most influential in Max Weber's mental modelling. We will therefore not revert to Martin Luther's thoughts for the purpose of this discussion. According to Weber (1905), it was John Calvin (10 July 1509 -27 May 1564) who introduced the theological doctrines which formed a significant new attitude toward work. Calvin's concept of predestination was not only revolutionary but in essence was the idea that provided, according to Weber, the impetus for a certain type of economic behaviour, which he described as the spirit of capitalism. Central to Calvinist belief was the elect, those chosen by God to inherit eternal life and who were thus predestined to this end. All other people were damned and nothing could change that since God was unchanging. Whilst it was impossible to know for certain whether a person was one of the elect, one could have a sense of it based on her or his own personal encounters with God. This inhuman doctrine stemmed a whole generation into a mood of depression and alienation. Who was elected and who was doomed? For Weber, the answer lay in economic activity. According to Calvinism and (later) Puritanism, the outer signs of grace like the sacraments and church membership were ineffective and powerless to 'save' anybody and could not guarantee security in faith. The answer was eventually found in continuous vocational activity (= work). Weber saw these thoughts in practice in the way in which the Puritans and specifically the American sects conducted work and their business. It was a vocation to please God, thereby obeying the calling of God to live and work in his honour. The harder they worked, the more wealth they accumulated and that, in turn, led to positive economic spirals (harder work, more affluence). Thus, this work ethic could be viewed as a self-sustaining motivator to create wealth. This was practical ascetism in a real-world setting and was based on an intrapersonal ascetism and not on an ascetism that led to a separation from the world in some secluded place. Outwardly, the only evidence of being included in the family of the elect was in the person's daily life and deeds, and success in one's worldly endeavours was a sign of possible inclusion. A person who was indifferent and displayed idleness was most certainly one of the damned, but one who was active, austere and hard-working gave evidence to himself or herself and to others of being one of God's chosen ones (Tilgher 1930). All people are supposed to work because it is the opposite of idleness and simultaneously the fulfilment of one's duty towards God. Work therefore became instrumental in reshaping the world after the will of God. Hording wealth per se was a sin, and therefore, the return on labour had to be invested into new ventures, over and over again. In addition to and closely aligned to the above, the 'doctrine of calling' (the believers or faithful are called to work towards the glory of God, and thus work itself is virtuous) and an inner-worldly ascetism (saving, investment, amassing capital and reducing costs especially on vices and luxuries) laid the ground rules that, according to Weber, established the spirit of capitalism. Calvinism as a strain or type of Protestantism (category) contained all the elements which fitted into the scheme that Weber perceived, as Bouma (in Furnham 1984:88) argues: 'The central thesis in Weber's work therefore is that PE provided moral justification for the accumulation of wealth.' This conclusion is based on the tendency to trace 'modern'18 capitalism back to its metaphysical roots (Furnham 1984:88). To understand something of the essence of Protestant work ethic as presented by Weber, it should be borne in mind that Weber followed Benjamin Franklin who offered a number of maxims for everyday conduct such as the following: diligence in work, scrupulous use of time ('do not be idle, for time is money'), 'be frugal in consumption, be prudent, be diligent and ever about your lawful business, cultivate your creditworthiness and put it to good use for credit is money' and the deferment of pleasure (Furnham 1984). These maxims had become part of the popular philosophy of work in the Western world during the 18th and 19th centuries as wealth created the confirmation of being elected (Furnham 1984:88) and were eventually incorporated into the writings of Max Weber (1905). Thus the doctrine of the elect and economic behaviour became linked inseparably. This link could only have survived because of its close relationship with real existential interests - in this case, real economic interests by real people in an economically driven world. Perhaps reference to a selected body of research will indicate that the concept is still being researched and discussed. At the same time, some empirical evidence points to the validity of the construct although this is not readily accepted without controversy in all cases. According to Giorgi and Marsh (1990), the construct 'Protestant work ethic' (PWE) was introduced into modern psychology as an assumption in the work of McClelland, who offered a social-psychological explanation for the link between Protestantism and capitalism (see also Furnham 1984). 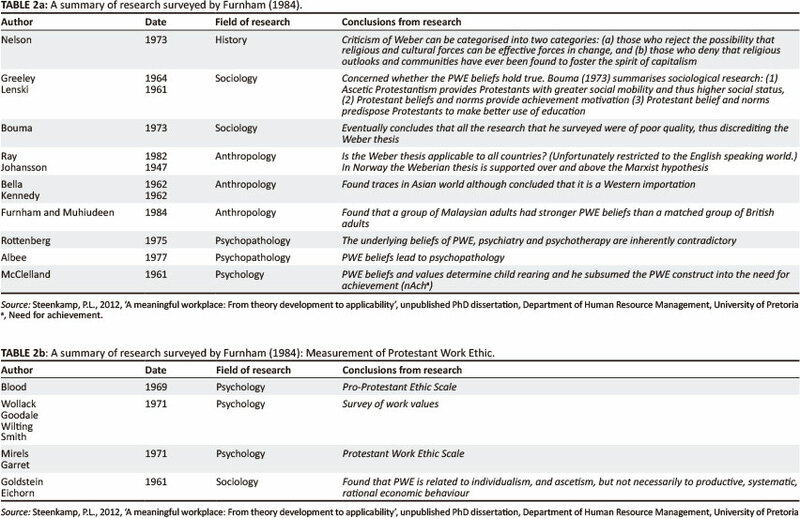 Furnham (1984) assessed the literature in respect of the construct PWE and documented many features based on research in psychological literature. Table 2a and Table 2b presents a summary of the research based on Furnham (1984:87-104) and includes information on researchers (column 1), date of the research (column 2), results and themes (column 3). The majority of research has been conducted with a focus on the PWE and paid employment. There is, however, a different angle which Furnham (1984) refers to, that is, the relationship between PWE and unemployment. In a study conducted by Furnham requesting respondents to rate the importance of various social-support programmes, it was found that 'PWE believers were exponents of social responsibility' but responded negatively regarding unemployment and social-benefit programmes (Furnham 1984:96). They (Giorgi & Marsh 1990:515) also indicate that work was (not always positively) linked with the degree of religious fervour, indicating that it was not those who claimed to be religious who endorsed the work ethic the most but those who claimed to be atheists. To eliminate the influence of variables such as religious denomination and the religion of their country, Giorgi and Marsh (1990) implemented certain controls in their research. Yet in spite of control mechanisms in their research, research participants who indicated their religious orientation as atheist nevertheless reported a positive view of work. Similarly, the Protestant cultural link did not disappear when the strength for religious fervour was controlled. In addition, Giorgi and Marsh also conclude that educational influence and differences indicate that people who had been educated for longer periods of time tended to reflect higher work ethics and values. Their study confirms the validity of the Protestant ethic as a living value system related to the experience of meaningful work. Can the Protestant ethic be measured? Are there demographic determinants that somehow play a role in PWE beliefs? According to Beit-Hallahmi (1979), PWE scores are closely related to religious self-identification. According to the study, Catholics and Protestants had a higher PWE score than people with other religious identification, that is, Jews and agnostics. As far as the relationship with political self-identification is concerned, conservatives projected a higher PWE score than what Beit-Hallahmi (1979:226) refers to as 'leftists'. In conclusion, Beit-Hallahmi (1995) indicates that the results may be interpreted as indicating that PWE as an ethical system should not be equated to motivation or achievement. PE can however more adequately be viewed as an approach towards work. It should be regarded as an orientation towards the place and role of work in one's life and society, which to a great extent is related to social background variables. However, at the same time, it reverberates with the studies that have been conducted on personal and work values. Williams and Sandler (1995) studied the differences between a group of American managers (subscribing to the PWE) and a selected group of Singaporean managers (subscribing to Confucian ethic - CE). They state that the managers that adhere to a PWE were more aligned towards commitment whilst managers subscribing to a Confucian ethic were more committed to satisfaction with work. The latter can be defined as the measure of pleasure and a positive emotional state that an individual experiences whilst performing a job. This measure of joy or pleasure is not limited to isolated cultures but encompasses global worker satisfaction with specific satisfaction dimensions, for example, satisfaction with pay, with the working environment and circumstances, supervision (and management practice), advancement and promotional opportunities, co-workers (social dimension of interaction in the workplace) and organisational practices (Griffin & Bateman 1986:158; Locke 1976:1300). (Hui 1992)? In contrast, commitment, as measured by a scale developed by Porter and others (Williams & Sandler 1995), measures an attitudinal posture. It captures and reflects the relative strength of an individual's identification with and involvement in an organization' according to Mowday, Porter and Steers in Williams and Sandler (1995). Weber could not have foreseen the discussion of his theses in the 21st century. Space however prevents a detailed discussion of the debate that is still continuing as a result of the Weber theses. Such an overview would indeed be informative and insightful but is passed by in this discussion. Two authors, who evaluated the relevance of the Weber thesis positively, albeit in a modernised form based on inferences drawn from the initial theses, are quoted. Conclusions, or rather certain implications, regarding the application of the Protestant ethic in respect of financial and, more broadly, economic governance, have also been pointed out by researchers in the 21st century. Etzrodt (2008:49) argues that the PE, as proposed by Weber, cannot be falsified when tested against what he refers to as 'modern capitalism', the founder of which, Adam Smith, was himself a neo-Calvinist. From this perspective, PE as described by Weber remains intact although there might be various strains of critique. In spite of this tendency, the application of PE requires a realistic orientation, based on realistic timelines in order to prevent the consumption mentality, or rather to defer consumption for the sake of affordability. It is now an opportune moment to return to the discussion on establishing a link between values and PE as a value system as far as meaningful work experiences are concerned. Protestant (work) ethic represents a certain mental model or approach towards work, which in its own right adds value to the experience of meaningfulness at work.21 The following discussion focuses on ethics in respect of work against the background of the chosen religio-spiritual system. This discussion will merely focus on the values underpinning the PWE in as far as these contribute to the meaning of work. Prior to embarking on a comparison between the core values emanating from the Protestant ethic and other work-value types, it is necessary to provide a list, or rather a structure, of the core values of this ethic. Hard work as such is viewed as a moral value. This is closely linked with what Weber referred to as the doctrine of calling and the doctrine of predestination. The external signs of being one of the elect are in the measure of success achieved in work, according to Weber. Work represents the fulfilment of earthly duties and is viewed as a calling. The P(W)E accentuates individualism as a value that is imbedded in a theological system that is referred to as Protestant or more specifically, Calvinism. At the same time, the individual within this scheme of values is also required to live in harmony with the internal (work community) as well as the external (social) community. In purely secular terms, this can be referred to as the abolishment of individual selfishness and transcending the boundaries of the self for the benefit of the other. Protestantism, or rather the underlying ethical and value system, underlines personal responsibility in the intra-personal as well as the interpersonal (social) domains of life and lived experience, and observable behaviour and work provides the framework for both the areas of responsibility. It represents a within-the-world, rational and practical ascetism without falling into the trap of Catholicism's separation from worldly events. In the sense that is used by Weber, it refers to a practical devotional lifestyle that is open to the world and its realities. It is tradition bound without ignoring the dynamics of change and adaptation in changing circumstances. Having stated the above, we can now turn to the alignment between PE, work value types and individual core values(Table 3). Although Table 3 provides an oversimplified perspective regarding the alignment and overlap between PE and work-value types, it is nevertheless indicative of the possibilities contained in the comparison. Reading across the rows, work-value type can be related to individual core values and the relevant description which, in turn, can then be related to the tenets of the Protestant ethic that can be back-fitted or associated with work values. The measure of overlap and flexibility between PE and the core work-value types creates the space to relate such ethical or value considerations as 'the accumulation of wealth, frugality, and reinvestment of return on investment, deferred consumption', et cetera as a type of capitalism or macroeconomic management and governance system, including financial management principles, that differs from outright consumerism. Following Dahrendorf (2010), a more fitting description could be 'responsible capitalism' thus retaining the structure and the content of PE whilst not necessarily retaining the descriptor 'Protestant'. PE does not only affect the attitude of the individual towards work but simultaneously poses a challenge in respect of the management of people within organisational settings, as well as issues that relate to organisational financial management and governance. Several conclusions can be drawn from the above discussion whilst bearing in mind that this article barely scratches the surface of a rich body of information. There is much more to be gleaned from the PE, work values and the meaning of work in the current time frame. It is a valid conclusion to state that the PWE, as an ethical system, is an identifiable and valid construct to which individuals purposefully subscribe, based on cultural influences and choice. This ethic also seems to be intrinsically imbedded in, or aligned with, core work-value types and probably in and with universal individual values pertaining to work. The PE has identifiable touch points with other disciplines such as psychology, management and economic sciences, theology, anthropology and sociology. The PE as a value system has robustly been indicated to correspond with work-value types and individual (human) core values. All of these values are seated in the individual, thus indicating an intrapersonal congruence of values. This serves as an indication of 'wholeness', thus directing the reasoning towards a perspective on the individual as a holistically integrated human being even within a work setting. The PE has its place in the world of work and as such acts as a facilitating force to perform to the best of a person's ability, thereby fulfilling a spiritual-based approach towards work, which best describes involvement in work as a calling or a vocation. Individuals who subscribe to the PE are more committed to the organisation, provided management practice creates the psychological and spiritual space for living these values. PE represents a certain mental model or approach towards work, which in its own right adds value to the experience of meaningfulness at work. Kelvin in Furnham (1984:99) does not foresee a total collapse or disappearance of PE. A transformation however seems inevitable. Closely associated with the PE is a 'wealth ethic' that is perceived as the basis for independence. Sufficient wealth would enable one to be independent of others' support. Work (in whichever format) that produces capital growth is the only way to achieve this objective. The economic substructure in relation to the work of the church must be noted. The output of a capitalist economic system serves as the financial supply side for religion. The church depends on this supply for the execution of her calling. Financial resources (which do not replace voluntary human participation in church activities) are required for growth and expansion. Every act of proclamation by the church in the world, whether a sermon, a pastoral intervention, diaconal support, providing food and clothing, catechism, et cetera can be construed as an economic act. This does not replace the deeper underlying dimension of the calling of the church and her obedience to voice of God. The fact that the church is imbedded in a world driven by economic factors and markers implies that the church is required to play an integral role in fostering a work ethic that will contribute towards economic growth and stability, eventually also benefitting her as far as her calling is concerned. The inculcation of an ethic that can serve as a driving force to embark on the path of purposeful economic activity is a notable dimension of the moral and ethical education within the church of her members. It is an ethic that is at home in the mental modelling of the believers and can eventually serve as the impetus to counter possible negative mindsets such as defeatism and economic hopelessness In this manner, the church can contribute to the economic wellbeing of South African society at large and serve her own purpose of the proclamation of the gospel. It must also be stated that the church has to fulfil her calling towards a society that is hampered by poverty by ensuring fair practice in terms of the management and governance within the domains of macro- and microeconomics. Underlying values and ethics grounded in a religio-spiritual system can counter the current trends in the South African economy which their roots in unabridged greed. The Protestant (work) ethic is more than a cultural norm that places a positive moral value on doing a good job. It is based on a belief that work has intrinsic value for its own sake (Cherrington 1980; Quinn 1983; Yankelovich & Immerwahr 1983). It is an imbedded value system of which the traces can be identified or recognised through the analysis of universal human values and work values. Like other cultural norms, a person's adherence to or belief in this particular work ethic is principally influenced by socialisation experiences during childhood and adolescence. A person learns to place a value on dedication and immersion in work behaviour for the benefit of the self and the bigger society, or you refuse this. A child appraises his or her performance in household chores or later in part-time jobs on the perspective of others. As she matures, these attitudes toward work become internalised, and work performance is less dependent on the reactions of others. These attitudes eventually become imbedded as deep-seated values and manifest in behaviour related to meaningful experiences at work thus perceptually transforming the workplace into a meaningful psychological and spiritual space. The principles and values emanating from PE, translated as the spirit or ethic of responsible capitalism, can indeed function as a contributory to a meaningful workplace. But can we still refer to the construct as 'Protestant ethic'? For some, it will always remain 'Protestant'. For others, the concept 'Protestant' might be offensive, or they might prefer some other expression such as the ethic or spirit of responsible capitalism. Whatever the choice, the underlying principles and values will always remain a work ethic that can contribute to meaningful work experiences and a value system that is aligned with universal individual values pertaining to work and to work-type values. By inference, it contributes towards the establishment and maintenance of a meaningful workplace. In the work-setting or as value system, PE does not present itself as either opposing or threatening other religious-spiritual value systems. It can be a value system that seeks economic growth and prosperity and which, for furthering the good of society, exist in harmony with other such value systems in the workplace. The possibility exists that a comparison of such belief and value systems (as mentioned earlier) might provide evidence of corresponding value types although with salient differences as was indicated in the comparison between managers subscribing to the 'Protestant ethic' and managers subscribing to a 'Confucian ethic'. For the current, it is argued that the ethic and value system underlying PE is still valid and remains in its core essence a valuable concept that can enhance, through the living of this core essence, the workplace experiences of employees whilst at the same time contributing towards the betterment of society. The author declares that he has no financial or personal relationship(s) which may have inappropriately influenced them in writing him article. 1. 'Abduction is the process used to infer to the best explanation for an event or phenomenon. It makes its start from the facts, without at the outset having any particular theory in view, though it is motivated by the feeling that a theory is needed to explain the surprising facts ... from a hypotheses which seems to recommend itself, without at the outset having any particular facts in view, though it feels the need of facts to support the theory ... it seeks a theory. Induction seeks for facts. In abduction the consideration of the facts suggests the hypotheses' (Sebeok & Umiker-Sebeok as quoted by Balnaves & Caputi 2001:37). 2.Originally 'coined' by Maximilian Weber (April 21, 1864, Erfurt, Prussia - June 14, 1920, Munich, Germany) in an essay with the title: 'The Protestant ethic and the spirit of capitalism' (1905, and transl. Kalberg in 2002). 3.It is possible to evaluate or describe other religion-related values that impact on the way in which the adherents approach work. This is however not the intent here as it would require a separate discussion and different approach from that followed in this article. 4.This 'model' was identified as one of the macro constituent dimensions of the construct 'a meaningful workplace'. 5.This is a measure based on cognitions and affects that reflect the degree of general importance that work has in the life of an individual at any given time (MOW International Team in Basini & Buckley 1996-1997). 6.The extent to which an individual defines and identifies working in terms of various roles such as task role, organisational role product or service role and occupational or professional role (Basini & Buckley 1996-1997). 7.The importance evaluations which are defined to include what the person knows about each of the outcomes and the preference relationship amongst outcomes (Basini & Buckley 1996-1997). 8.The absolute and relative importance of work-related goals such as job satisfaction, work values and incentive preference (Basini & Buckley 1996-1997). 9.From traditional work ethics, it is possible to derive the orientation of work-related social norms that refer to working as an individual or collective obligation to society, whether such social standards are religiously or otherwise underpinned (Basini & Buckley 1996-1997). 10.The results of the study by Ros et al. (1999) revealed the following: Prestige work values oppose social-type work values, expressed as self-enhancement versus self transcendence. Extrinsic work values correlated positively with conservation values and negatively with values concerning openness to change whereas intrinsic work values correlated negatively with conservation values and positive with values concerning openness to change (Ros et al. 1999:59). I do not share the mutual exclusiveness of the different value types as postulated by Ros et al. (1999). 11.Consider the work of Isaac Newton in respect of his article: 'Three laws of motion' (Newton 1846:19). 12.Other influences that contributed to the disappearance of optimism include the following: the mass dissemination of information through print; the long-term consequences of the Church Reformation formulated certain dogmas that contributed to the negative experiential effect by people; the French Revolution (1789-1799) - intended to overthrow tyranny, replaced it with formidable tyranny, that is, Napoleon. 13.Tendencies included, for example, the loss of independence and decision making in passing from a subsistence mode of living to the selling of manual labour, the passing on of energy and know-how to the industrialists, the transformation of a society sustained by barter to a society which became dependent on monetary means, et cetera. 14.Although this 'discovery' was made in 1911 only (Le Roux 2004:477), it is not an error to assume that it was starting to reach fruition seven years earlier. 15.The discussion is at best fragmentary and elective in relation to the purpose of this article. 16.Protestantism, without succumbing to a highly technical theological definition, can be described as a religious movement based on Christian doctrine. As a religious movement, it originated during the 16th century as a result of the protest and resulting controversy and protestation against Roman Catholicism and the Roman Catholic doctrine. It included denying papal authority and the perspective that the pope was the representative of Christ in the world by Martin Luther, John Calvin and other Church reformers. The central belief in the Protestant theological system states that the justification of the sinner is by faith alone. 17.The detailed history and theological dissemination of thought during the Reformation by Reformation thinkers can be followed in works dedicated to these themes. This is not the place to go down that avenue - the discussion is only relevant as far as this article goes. 18.Modern in the sense that Weber used it and not modern in the sense of contemporary. 19.This statement could in a broad and even in a narrow sense of the word be interpreted as a condition for a meaningful workplace. Work as such, in terms of the intrinsic values, carries meaning in itself. A socially acceptable environment within which work is done and where the organisation benefit the individual and society offers at least one conceptual base for a meaningful workplace. It is an empowering environment within which personal aspirations can be fulfilled. 20.This does however not exclude the collective dimension as indicated earlier. Individuals in the workplace are not islands in and of themselves. There is always a communal dimension or what can be referred to as workplace community. Within such a context, the interests of the group and eventually the organisation is at stake. 21.However, this does not imply that other religio-spiritual systems do not add value in terms of the experience of meaningful work. The discussion here is an analogy to the value that religio-spiritual systems can add to the experience of meaning of people at work. It is thus acknowledged that systems such as Judaism, Islam and Buddhism (and others) could argue that adherents to these also experience meaning whilst working, based on the particular underlying values. This study does not intend, nor is it the scope thereof, to compare the contribution towards the experience of meaning whilst working of the different religio-spiritual systems.